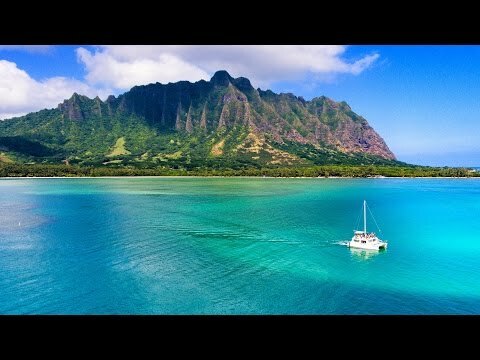 Settled somewhere in between rugged cliffs on the north and beautiful beaches on the sought, in the middle of Pacific Ocean, Hawaiian largest city is Honolulu. The whole town is not particularly large; the general population is around 1 million residents. However, there are so many beautiful places you can visit here. Depending on your interest, this city will offer you culture diversity, no matter from what part of the world you are coming. These attractions will blow your mind, and because of them, you will love Hawaii even more. This is a magical spot and you should not miss out on the opportunity to visit on your trip to Hawaii. Located on the east side of the city, Hanauma Bay is one of the most famous places people visit for snorkeling. The golden sand that surrounds the bay, well-preserved nature and the bay that is sunken into a crater, will make you stay here forever. When you arrive at Hanauma Bay, you are required to watch a short video about the marine life and then you can take a 5-minute walk to the bottom of the crater so that you can get to the beach. If you are an early riser you arrive here between 6 am, and 7 am, you aren't required to pay parking lot and entrance fee. Manoa Falls are a great place to visit while staying in Honolulu. You will get a chance to experience a lush green jungle hike. You don’t have to be physically fit to take this walk; it will only take you 30 minutes through a dense tropical forest to reach them. But, when you get there, you will see it was worth of your trouble. By taking this hike, it’s a good way to stretch your legs and to get familiar with some of the Hawaiian plants and trees. Pearl Harbor is more of a memorial than a tourist attraction, but still many people visit it each year. Once you arrive here, you will watch a shot movie which explains the history of the place. After that, you will take a 5-minute ferry ride which will take you to USS Arizona Memorial. You will spend 15 min there paying the respect to the killed soldiers.